Definition at line 1211 of file detect.h. Definition at line 1216 of file detect.h. Referenced by MpmStoreFree(), MpmStorePrepareBuffer(), MpmStoreReportStats(), and RetrieveFPForSig(). Definition at line 1215 of file detect.h. Definition at line 1220 of file detect.h. Referenced by MpmStoreFree(), MpmStoreReportStats(), PatternMatchPrepareGroup(), and RetrieveFPForSig(). Definition at line 1218 of file detect.h. Referenced by MpmStoreFree(), and MpmStorePrepareBuffer(). Definition at line 1212 of file detect.h. 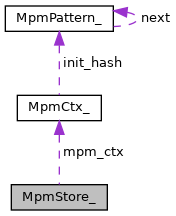 Referenced by MpmStoreFree(), MpmStorePrepareBuffer(), and RetrieveFPForSig(). Definition at line 1213 of file detect.h. Definition at line 1217 of file detect.h.